If selected, this option causes only the objects currently selected in the active panel to be included in the list. If selected, this option causes all objects shown in the active panel to be included in the list. Lets you choose the character that should be used to separate fields in the list. If selected, this option causes the names of the fields to be added as the first row of the list. Lets you select the character to be used as the text qualifier. If selected, this option causes the names of the objects to contain no more than the number of characters entered. (If the name of an object is longer, it is truncated). If selected, this option causes the list of the objects to be copied to the Windows Clipboard. You can then paste the list into a word processor or text editor for further formatting or printing. 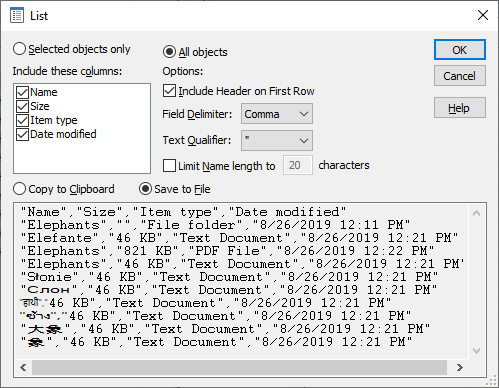 If selected, this option causes the list of the objects to be saved in a file. You can later import the list form the file into your spreadsheet or database application, or print it out.